All charges against Empire actor Jussie Smollett have been dropped. The gay actor had been facing 16 felony counts after claiming in January that he was the victim of a homophobic and racist attack. However, in an unscheduled court appearance in Chicago on Tuesday (March 26), the state filed a motion to dismiss all charges against him, and seal the case. The judge accepted the motion. It is unclear what development led to the abrupt decision from prosecutors to end the case. Speaking to the media, Smollett said: “I want to thank my family, my friends, the incredible people of Chicago, and people all over the country and the world who have prayed for me, supported me and shown me so much love. He added: “I have been truthful and consistent on every single level since day one. I would not be my mother’s son if I was capable of one drop of what I was accused of. In a statement to ABC, Jussie’s Smollett’s attorneys, Tina Glandian and Patricia Brown Holmes, said: “Today, all criminal charges against Jussie Smollett were dropped and his record has been wiped clean of the filing of this tragic complaint against him. “Jussie was attacked by two people he was unable to identify on January 29. The attorneys added: “Jussie and many others were hurt by these unfair and unwarranted actions. “This entire situation is a reminder that there should never be an attempt to prove a case in the court of public opinion. That is wrong. 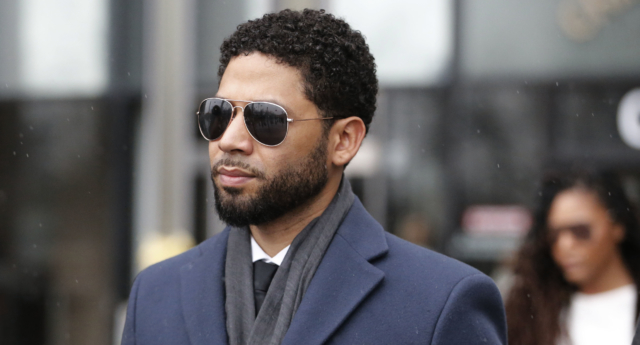 No plea deal was struck, though Smollett’s lawyers confirmed he agreed to forfeit a $100,000 bond. The gay actor maintained his innocence throughout the ordeal, entering a not guilty plea on March 14. The actor was suspended from Empire after the charges were filed, and written out of the remaining episodes of the show’s fifth season. Chicago police had accused Smollett of faking the incident by paying associates Abel and Ola Osundairo $3,500 to fake an attack, though his lawyers asserted that the money was in fact a personal training fee. He added: “Their motivation, I’ve got my theories on it, but I haven’t seen one piece of evidence that links Jussie to this. What they do have is a whale of a case. If you believe what the police chief is saying, they’ve got a great case against the two brothers. “They’ve got Lyft receipts, they’ve got ATM receipts, they’ve got a surveillance video, but what do they have that corroborates the story? Geragos, who has since been caught up in a separate scandal himself, also referred to an ongoing probe within the Chicago Police Department over the leaking of false information relating to the case. In a statement, the Smollett family said: “Our son and brother is an innocent man whose name and character has been unjustly smeared. The statement adds: “While many were quick to rush to judgement before hearing the actual truth, we are grateful that the truth about Jussie has come to light.